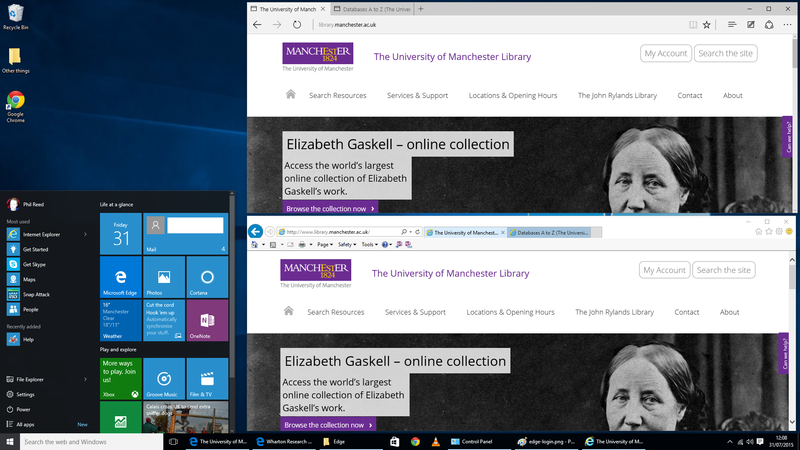 Microsoft Edge is the new, default browser in Windows 10 (top) but Internet Explorer 11 is still available (bottom). The newly released Windows 10 is a currently a free upgrade from Windows 7 and Windows 8.x. It claims to “transform the way you work and play” amongst other things. It also marks the launch of a new web browser Microsoft Edge, replacing the 20-year old Internet Explorer (IE). Edge is a great move forward for web developers and hopefully will be preferred by end users but, as always, change comes at a cost; the many legacy web-based platforms that were built for IE 6 or later may not work. Fortunately, IE 11 is still available for the sake of compatibility, but is using Windows 10 and multiple web browsers a smooth ride? How compatible are our business databases with Windows 10? 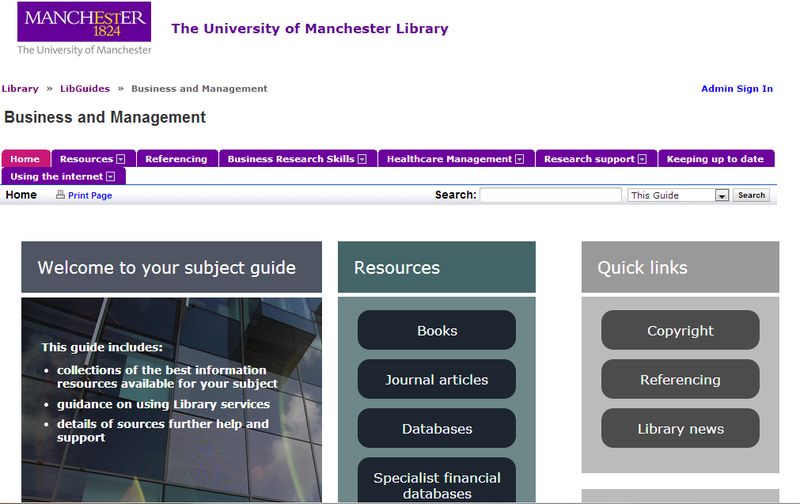 Some of the specialist financial and business databases that The University of Manchester subscribes to have been tested below. The desktop search in Windows 10 looks for applications, files, on the web and more. These two reputable products are widely used but they are built on old technology (old by web development standards). They were already limited to work on Internet Explorer only in Windows XP, Vista, 7, 8 and 8.1. ThomsonONE.com shows a blank screen if loaded in Microsoft Edge. Thomson Research will load but some of the dialog windows do not work in Microsoft Edge. So far, I have found that all out other web-based specialist databases are compatible with Microsoft Edge. Please comment below this post if you find otherwise! I will update this post as necessary. A later post on Business Research Plus will explore databases that use Microsoft Office 2016 and Windows 10. Where can I find bond credit ratings for a particular company? Bond credit ratings are available from several of the databases we subscribe to. For S&P, Moody and Fitch ratings on bond issues, use Thomson ONE.com. You can look for one company at a time. ThomsonONE.com: 1 Select company. 2 Choose Company Views > Deals. 3 Change filter to Product: Bonds. 4 Scroll to Deal Statistics. Alternatively use Screening & Analsysis to look for multiple companies. Include datatypes SP, MDY, FITCH (all have descriptions Ratings…) in your report. Fitch ratings are available on Thomson Research. Select Fitch Ratings as contributor. Thomson Research: search for Contributor: Fitch Reports. 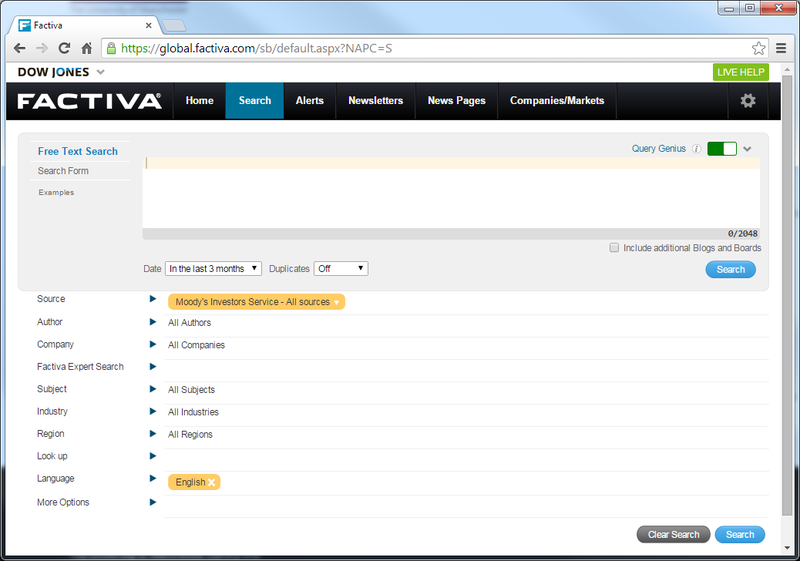 Moody’s Investors Service reports are available on Factiva. Search for Moody as source, with company name or upgrade/downgrade in text. As with Thomson ONE.com, credit ratings are available on Datastream by searching for a company’s bonds and then selecting the relevant datatypes. A similar approach can be taken with Capital IQ. Note: What is a Corporate Credit rating? Thomson ONE.com (or T1.com) is Thomson Reuters replacement product for Thomson One Banker. It covers financial data on over 70,000 active and inactive public quoted companies globally – including key ratios, capital structure, latest deals, top holders and events. Market awareness pages provide quick access to world indices, currencies and key exchange metrics like new highs and new lows, LIBOR, Benchmark bond yields and Treasury rates. Like Thomson One Banker, T1.com also provides access to deep content sets such as Ownership, Deals, Private Equity, plus Company Events. For researching public (quoted) companies Thomson ONE.com is one the best international company databases available to current staff and students at the University of Manchester. 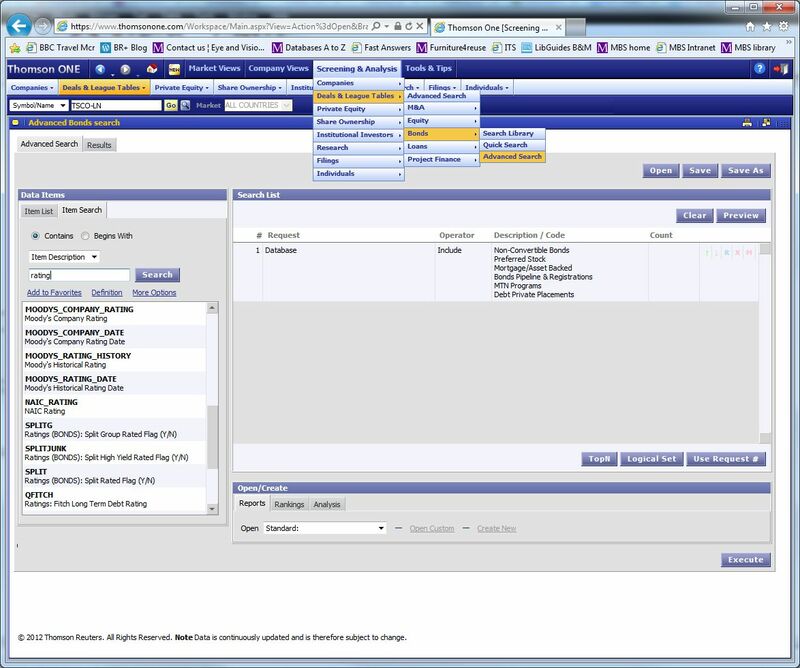 Other databases like Bloomberg or Thomson Reuters Datastream are only available on specific PCs in the library. If you have used Thomson One Banker before, T1.com gives you an improved interface, additional market awareness and news, and convenient access to analysts’ reports that we previously accessed through Thomson Research. 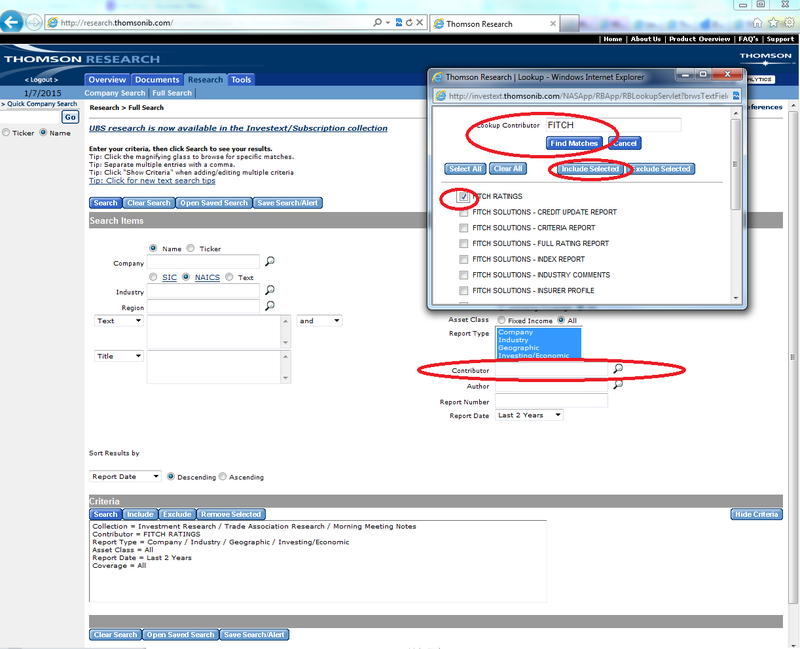 All the Business Research Plus tips for Thomson One Banker and Thomson Research will be relevant to Thomson ONE.com. Thomson ONE.com is only compatible with Internet Explorer versions 7, 8 and 9. 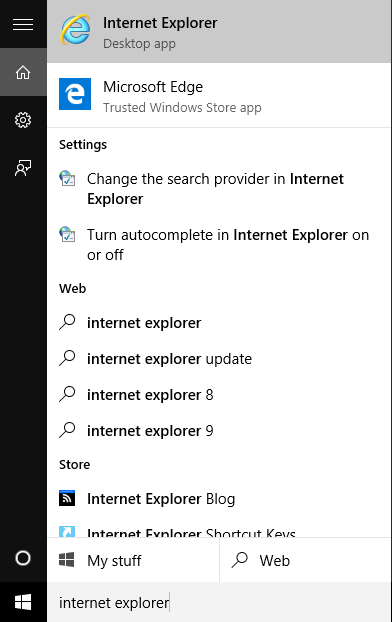 In IE 10, set to compatibility mode IE 9. For all versions, allow IE to accept pop-ups. Unfortunately Thomson Reuters corporate clients are not pressing the company to make it available on more recent versions of IE. If you fail to allow pop-ups you will get returned to the T1.com home page and have to redo any searching you had started. Professional analysts provide target prices for the companies they research. This information is available at different levels of detail from different sources, and therefore there is not a single source that is always the best when looking for target price data. 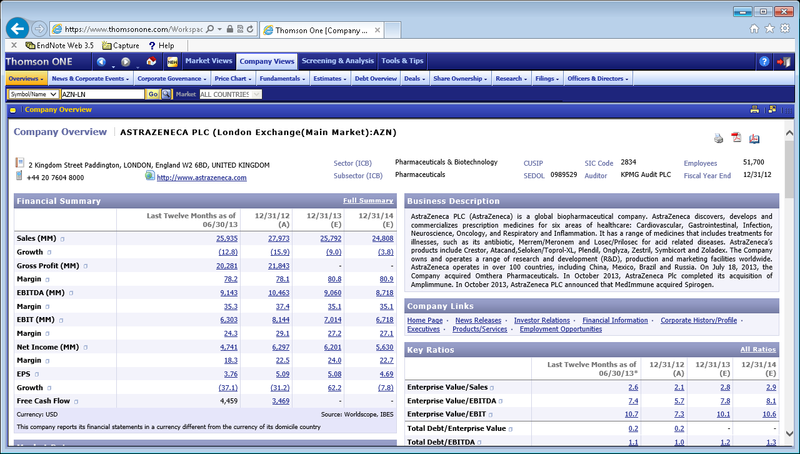 This is for 15 November 2013 when the ARM share price closed at 944 (UK pence). Yahoo Finance UK – ARM.L – Analyst Opinion. Thomson Research will give you more information behind the analysts’ target prices. It gives you access to the analyst reports that include the reasoning behind target prices. However, this is at the detailed level: the reports describe the target prices of an analyst, or group of analysts. There is no report that describes the consensus target price, such as the ARM mean target price of 1,048.28p (based on 25 detailed broker target prices). For more detail see Analysts’ Reports on Thomson Research (which unfortunately only works with IE – Internet Explorer). Thomson Reuters Datastream only gives access to consensus target prices, in contrast to the detailed target prices on Thomson Research. Datastream does give access to historical consensus target prices. Bloomberg Professional and Thomson One Banker are sources for both consensus and detailed target price data. If you are looking for numbers, rather than the text behind the numbers, for a single company or a small portfolio these are excellent sources. The best source for researchers who want to study target prices is IBES (I/B/E/S – Insitutional Brokers’ Estimate System) from Thomson Reuters on WRDS (Wharton Research Data Services). WRDS provides access, supporting documentation and online support to several databases used by leading accounting and finance researchers worldwide. Like other databases on WRDS, IBES has an excellent research reputation. Recent University of Manchester research looked at target prices across 16 countries over 2002-2009 and found that analyst target price forecast accuracy is higher than a naive price forecast. The study identified various factors that affect target price accuracy – forecasts are more accurate in countries with higher accounting disclosure quality (Bilinski, Lyssimachou, and Walker, 2013). Bilinski, P., Lyssimachou, D. and Walker, M. (2013) “Target Price Accuracy: International Evidence”, The Accounting Review, 88(3), pp. 825-851. On 20 Nov 2012 Hewlett Packard (HP) announced that it was taking a write off of $8.8 billion of the $11.1 billion that it paid to acquire Autonomy in October 2010. At the time Automony was a member of the FTSE 100 and seen as a UK technology success story. There has been lots in the UK financial press since then as HP’s key argument is that they overpaid for Autonomy because of accounting manipulation. This is strongly denied by Automony founder Mike Lynch. Aswath Damodaran’s Musings on Markets blog makes a strong case that even if HP is right this only accounts for $2.45 billion of the $8.8 billion write off – see HP’s Deal from Hell: The mark-it-up and write-it-down two-step. The write off raises issues about the acquisition in terms of corporate strategy, leadership, corporate governance as well as the accuracy of Autonomy’s accounts. Thomson Research – analysts reports – For example, on 23 Aug 2011 Marc Geall of Deutsche Bank published a report on Autonomy Corp plc. This reported a change of recommendation to sell, since the shares were GDP 24.86 almost fully valuing the HP offer, and substantially higher that Deutsche Bank’s fundamental target price of GBP 17.50. Forbes.com (2012) ‘With Autonomy, H-P Bought An Old-Fashioned Accounting Scandal. Here’s How It Worked’ Forbes.Com, (November 20, 2012):p. 39, Business Source Premier, EBSCOhost, viewed 11 January 2013. See also those posts with the mergers_and_aquistions tag.